They’re calling this newly discovered dinosaur “thorny head,” and it’s changing what we know of North American ankylosaurs, the heavily armoured herbivores that had the misfortune of living alongside Tyrannosaurus rex during the Late Cretaceous. 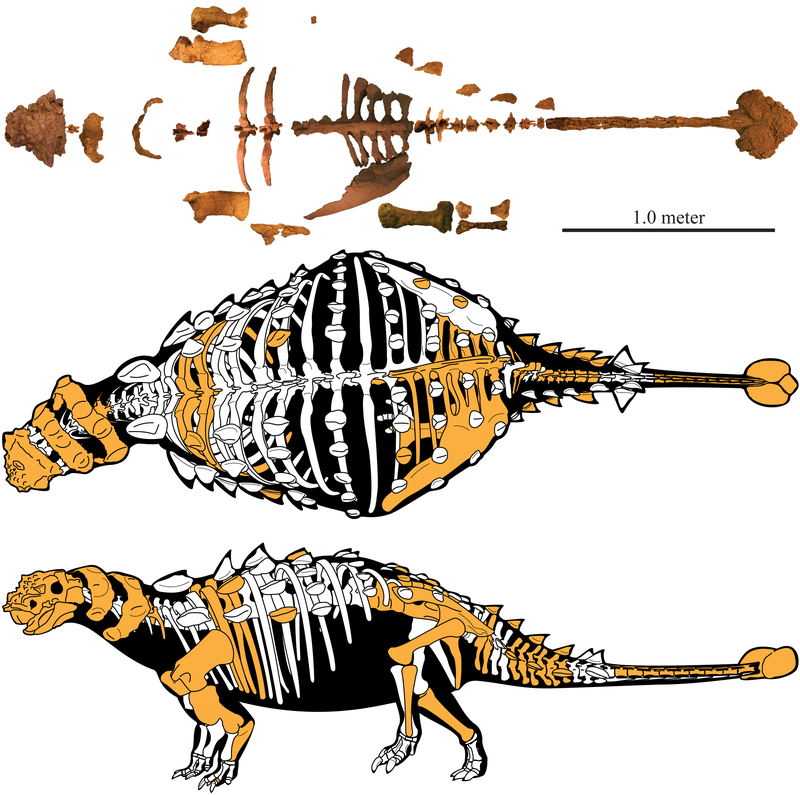 Behold Akainacephalus johnsoni, a new species and genus of ankylosaurid dinosaur. It’s considered the most complete Late Cretaceous ankylosaur ever found in Utah – or in the entire southwestern United States for that matter. Unlike other North American ankylosaurs that lived around the same time, this particular dinosaur featured spikes and cones on its head and snout, hence its name, which translates to “thorny head.” The latter half of its name, johnsoni, honours Randy Johnson, a museum volunteer who helped to prepare its skull. The details of this remarkable new creature were published today in the science journal PeerJ. The fossilised remains of Akainacephalus johnsoni were discovered in Grand Staircase-Escalante National Monument in south-central Utah. Its bones were buried in 76-million-year-old rocks of the Kaiparowits Formation, a geological layer composed of sedimentary rocks deposited by rivers and streams. Artist’s impression of the new ankylosaurid. Working in this high desert terrain, palaeontologists from the Natural History Museum of Utah and the University of Utah managed to pull out a number of bones, including an immaculately preserved complete skull, bony armour (including neck rings and spiked plates), several vertebrae, a forelimb, various hindlimb bones, and nearly complete tail with the iconic ankylosaur club still attached. In all, it took palaeontologists nearly four years to assemble and fully prepare the bones for analysis. Akainacephalus johnsoni had a medium build, measuring between 13 to 16 feet (4-5 m) long and about 3.5 feet tall (1.5 m) at the hips. Its four legs were positioned directly below its body. Like other ankylosaurid dinos, this creature was built for defence; it featured formidable armour from head to tail, including bony plates called osteoderms. Its head was adorned with a crown-like covering of spikes and horns, and the tip of its tail was equipped with a large bony club, which it likely used to ward off predators. Indeed, as its tank-like appearance suggests, A. johnsoni needed these extreme defences to survive the brutal conditions of Late Cretaceous North America. This herbivore would have come into regular contact with its contemporary Tyrannosaurus rex, among other predators. The dino’s skull being prepared for display. This discovery shows that ankylosaurids were more diverse in their physical characteristics than palaeontologists thought. These dinosaurs originated in Asia between 125 million to 100 million years ago, but there’s no sign of them in the North American fossil record until about 77 million years ago. 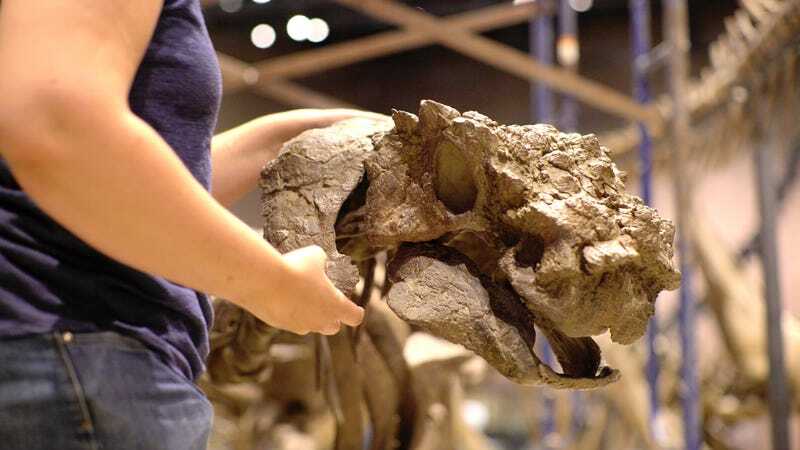 The spikes and cones found on the skull of Akainacephalus resemble those of its ankylosaurid cousin, the New Mexican Nodocephelausaurus kirtlandensis, but that’s about it. Other North American ankylosaurids, like Ankylosaurus, Euoplocephalus, and Ziapelta, featured smooth bony armor on their skulls. The authors of the new study, Jelle P. Wiersma from the Natural History Museum of Utah and Randall B. Irmis from the University of Utah, suspect that Akainacephalus and the New Mexican Nodocephelausaurus are more closely related to some Asian ankylosaurids. A working hypothesis is that two separate groups of ankylosaurid dinosaurs existed in North America during this time, and that a second migration wave from Asia, likely via a land bridge, made it possible. Skeleton of the new armoured dinosaur as represented by preserved bones.